Meanwhile, in small bowl, combine mayonnaise, mustard and dill; mix well. Spread mayonnaise mixture evenly over cut side of each half of bread. 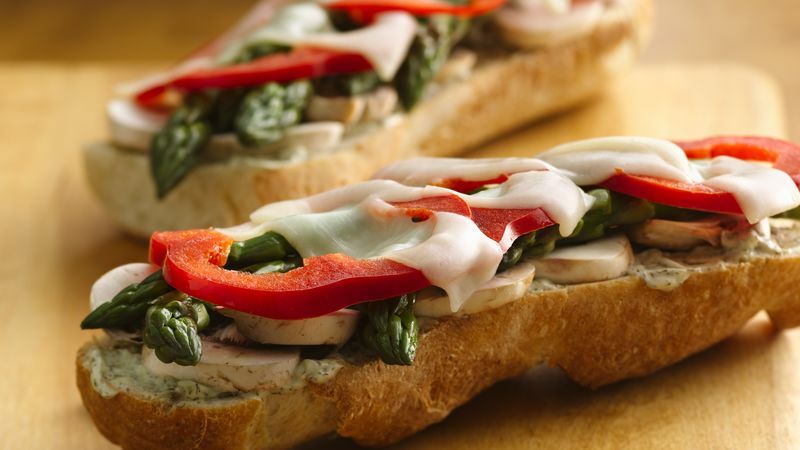 Top each sandwich with mushrooms, cooked asparagus and bell pepper rings. Cut cheese into 1-inch-wide strips; arrange over peppers. Place on ungreased broiler pan or cookie sheet. * To cook asparagus in steamer basket, arrange spears in basket in skillet; add water. Cover; steam 3 to 5 minutes or until crisp-tender. Remove from steamer; continue as directed above.